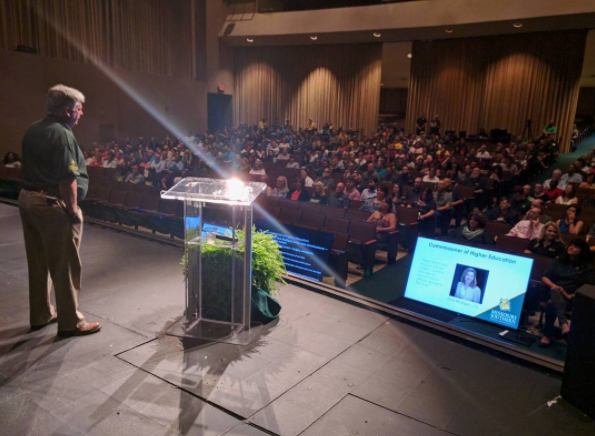 Mark your calendars: The All-Employee Welcome Back meeting is set for 8:30 to 10 a.m. Friday, Aug. 18, in Taylor Performing Arts Center. All campus employees are encouraged to attend. Refreshments will be offered in the lobby of the auditorium from 8:15 to 8:30 a.m. The meeting is a chance for faculty and staff members to gather together for an update on campus priorities and progress at the start of the Fall 2017 semester. School and department meetings will be held from 10:15 a.m. to noon across campus, while the All-Employee Celebration is set for 6 to 9 p.m. at the Elk’s Lodge, 1802 W. 26th St. Employees may bring a guest; dress is casual.